TOKYO (Bloomberg) -- Takata Corp., the supplier behind the auto industry's biggest recall ever, estimated that a comprehensive callback of its airbag inflators would cost about 2.7 trillion yen ($24 billion), according to a person familiar with the matter. The worst-case recall scenario would involve 287.5 million airbag inflators, said the person, who asked not to be identified because the company's deliberations are private. Takata and the automakers still have to determine how the costs are shared, the person said. A representative for Takata declined to comment. The projection by Takata exceeds a February estimate by a Jefferies Group LLC analyst by about $7 billion and reinforces concerns about the company's viability. The worst-case cost figure is almost four times more than the revenue Takata has forecast for the fiscal year ending this month. It also amounts to almost six-times more than the total assets on its balance sheet as of the end of 2015. "Even if this is the worst-case simulation, it shows the company has seen some possibility," Ken Miyao, an analyst with Tokyo-based market researcher Carnorama, said. "The question is how much the carmakers want to split the costs. But even if Takata only bears half of the cost, this would still be beyond their scope." Takata shares plunged by about 20 percent to 414 yen, hitting the lower daily limit in Tokyo trading. Daicel Corp., the Japanese airbag inflator maker that's been in talks with Takata to boost supply of the components, rose 1.8 percent. Ningbo Joyson Electronic Corp. gained as much as 6.8 percent in Shanghai trading, while Autoliv Inc. traded 1.3 percent higher in Stockholm just after the market opened. The National Highway Traffic Safety Administration has said Takata airbag inflators have caused nine fatalities in the U.S. by rupturing and spraying plastic and metal shards at motorists. The regulator is investigating all Takata inflators that use a chemical propellant that's been banned from future models and is giving the company until as long as the end of 2019 to determine the root cause of the flaw or prove the inflators are safe. Moisture seeping into Takata's inflators was determined to be the reason Takata airbags have ruptured by Orbital ATK, a researcher hired by a coalition of automakers that announced its findings last month. Challenges with determining root cause of the rupture issue have held back automakers and the supplier from deciding how the companies will divide costs. 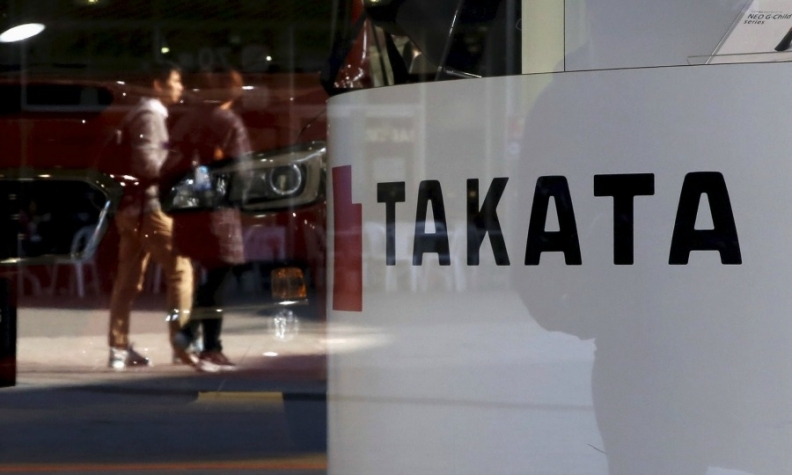 Expenses stemming from Takata airbag recalls have totaled about 607.8 billion yen, Takaki Nakanishi, an analyst with Jefferies, wrote in his Feb. 24 report. He estimated future expenses assuming an average cost of about 9,000 yen per unit. "It is not difficult to imagine how hard it will be for Takata to rebuild its financial standing if the expenses are apportioned," Nakanishi wrote. "The Japanese automotive industry cannot avoid seriously adopting an exit strategy from the Takata issue."